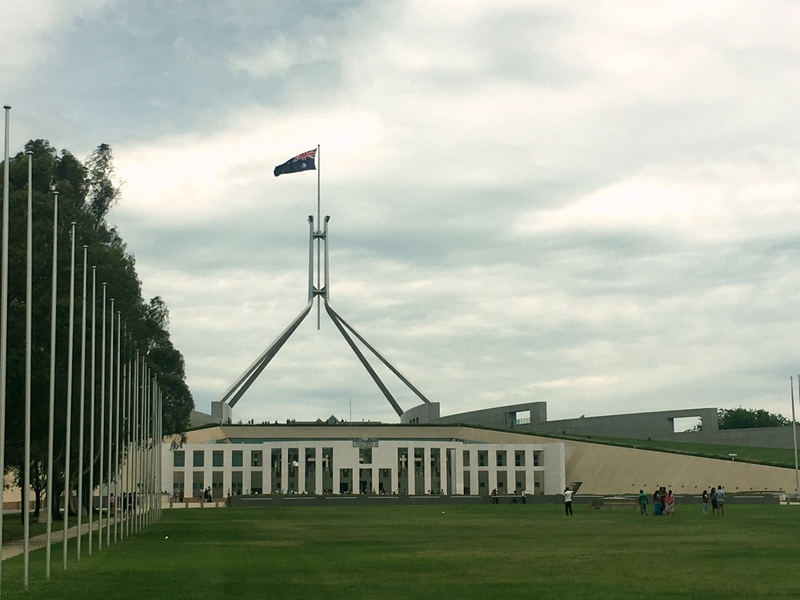 Canberra, Australia’s capital city with fewer than 400,000 people, was a radical change for us: after consecutive four-night stays in Mossman, Palm Cove, Surfers Paradise, Brisbane, Fraser Island, and Sydney, we only stayed three nights in Canberra. Big change, but not big enough: Canberra wasn’t worth three nights. We arrived in Canberra on December 27 when summer holidays are in swing, the parliament is out of session, and government offices are closed. In the best of times Canberra is a pretty sleepy place and this was about the worst time to be here. Kind of like August in Paris if that were coterminous with Chinese New Year. Most of the restaurants were closed and pretty much all the stores were closed. Dead. Quick history. Australia achieved “Dominion” status inside the British Commonwealth – essentially independence – in 1901. Up until then, the six Australian states had been separate political entities, but once they federated as a single country they had to pick a capital. Sydney and Melbourne both wanted the capital but each had effective veto power over the other. The compromise, reached in 1908, was that the capital would be in New South Wales – Sydney’s state – but in a separate jurisdiction called the Australian Capital Territory or ACT (not unlike the District of Columbia) and that it would be located at least 100 miles from Sydney. Ultimately Canberra was selected as the site, with Melbourne serving as the seat of the government – but decidedly not the capital – until the new city of Canberra was finished in 1927. Today the Australian Capital Territory, like D.C., is not formally a state. It does have a degree of self-government that D.C. lacks, however, and the people living there have full representation in parliament. So yeah, a little more democracy than the citizens of Washington experience. And, like D.C., Canberra is a planned city with all the weaknesses that entails especially regarding the lack of any organic older city feel to it. And lacking the population and density D.C. has achieved makes Canberra – at least at Christmas time – kind of a big nothing burger. Now there were a couple bright spots in our little detour through the capital. One, we went there by train which just hasn’t worked for us anywhere else in Australia. Sure, a slow train – this is no China, after all – but train travel beats flying by a big margin. And as Americans we can hardly complain about other countries not having great train networks. There were two museum exhibitions while we were that had great potential. The National Museum of Australia was hosting A History of the World in 100 Objects from the British Museum. Great potential but there was one big problem: the exhibit was absolutely packed. It was the last thing we expected. How could the museum be packed when the city was empty? But it was packed; you really struggled to get close to most of the objects. 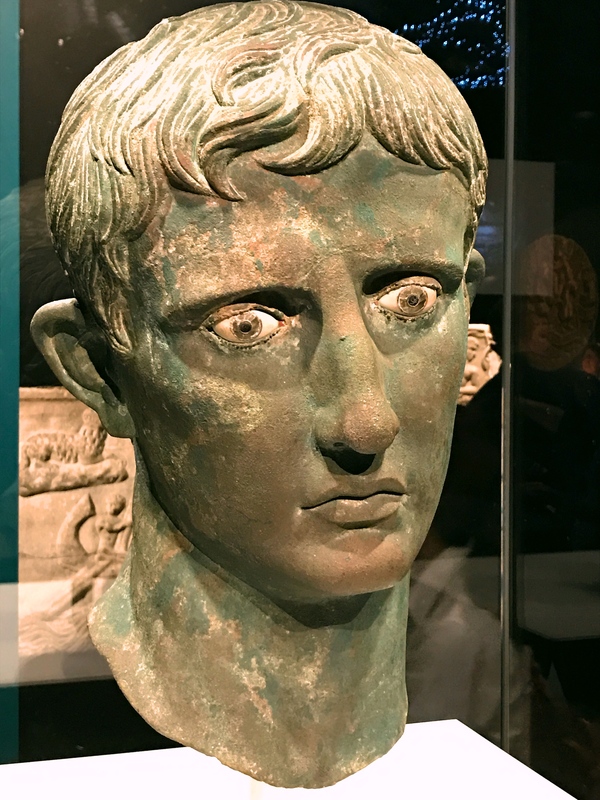 It was an impressive collection of items: a coin showing Alexander the Great’s profile, a bust of Augustus, some Greek, Mayan, Chinese stuff … pretty comprehensive. But they needed some serious crowd control. This soccer jersey was the 99th of 100 items to tell the history of the world, and it has a great story. 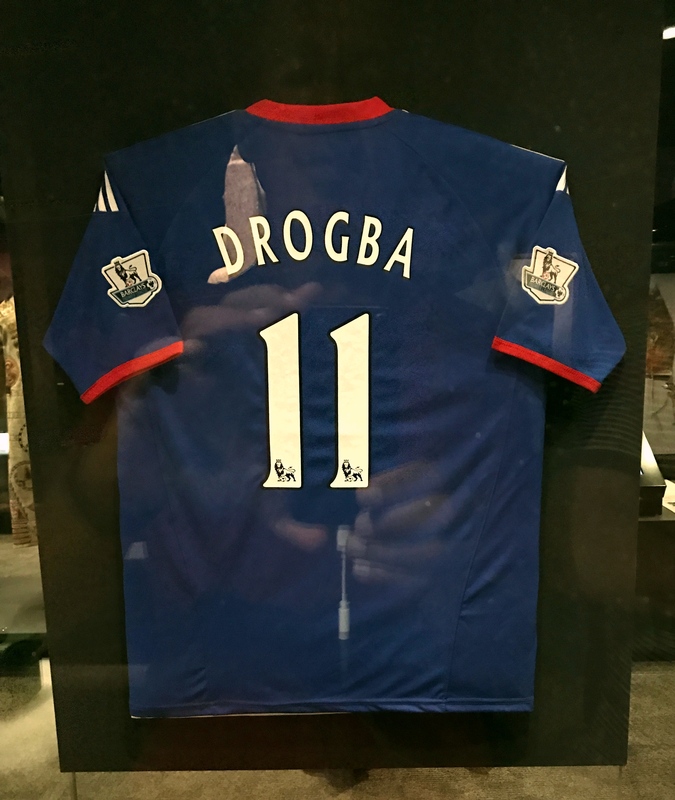 The player, Didier Drogba, is from the Ivory Coast but grew up in France. He plays for Chelsea FC, a London team that is owned by a Russian and sponsored by Samsung, a Korean company. It’s a knock-off rather than the official jersey, made in Indonesia and purchased in Peru. Thus it is a pretty impressive representation of today’s global interconnections. Then the National Gallery of Australia was hosting an exhibit called Versailles: Treasures from the Palace. So off we schlep to the Gallery … only to find a line with probably 100 people waiting to get in. And we were told that once you got in it was really crowded in there, too. So heck, we just decided to go to Versailles next spring and see the stuff there ourselves. But – and it’s a big but – we loved the rest of the National Gallery. Loved it. There was some great Australian and aboriginal art, mind-blowing Chinese art, a couple rooms of geometric abstraction, and a nice collection of 19th and 20th century European stuff. All with great descriptions and all the space you need to enjoy it without the crowds who were all waiting in lines to see Versailles. While Canberra was mostly a big miss, the National Gallery helped redeem our time there. 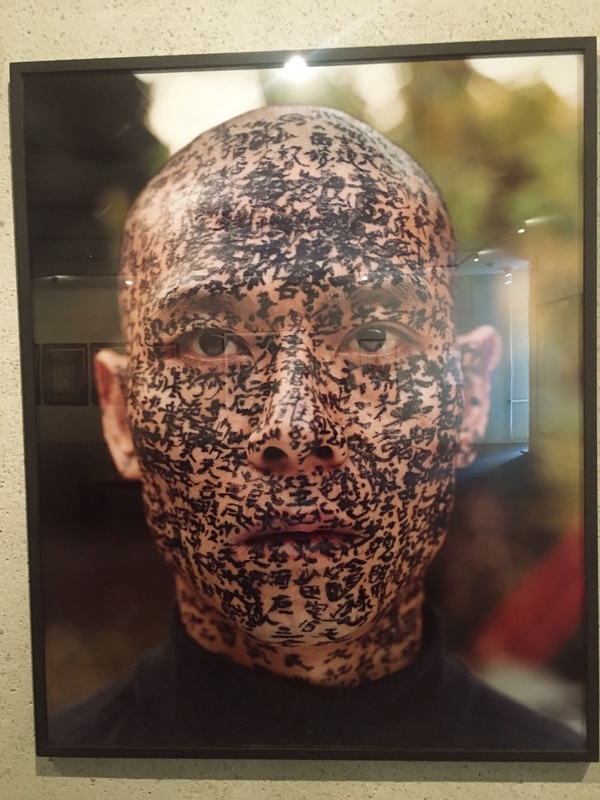 This is Zhang Huan, a contemporary Chinese Artist. 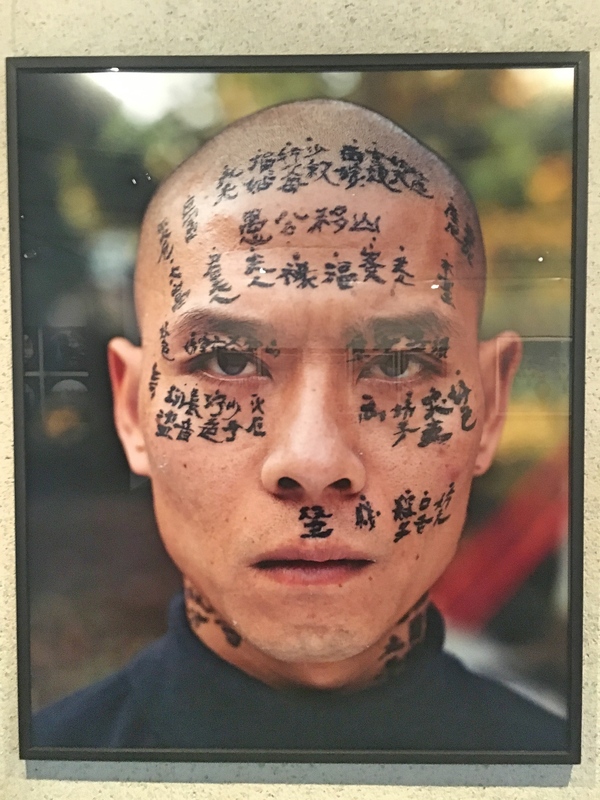 He had three calligraphers spend a day writing on his face and neck relating family and traditional stories about fate. It starts slow until his entire head is just glossy black. You had to see it. Oh, and our hotel room had a washer/dryer in it, too, which certainly counts for something! Meanwhile Mark continues to do massive planning for our summer months through Europe. To make sure we get the hotels we want, and as long as the dollar is so strong relative to the euro, we’re booking things pretty tightly for the summer. From here we’re off to Melbourne to see a bunch of friends and ring in the new year. 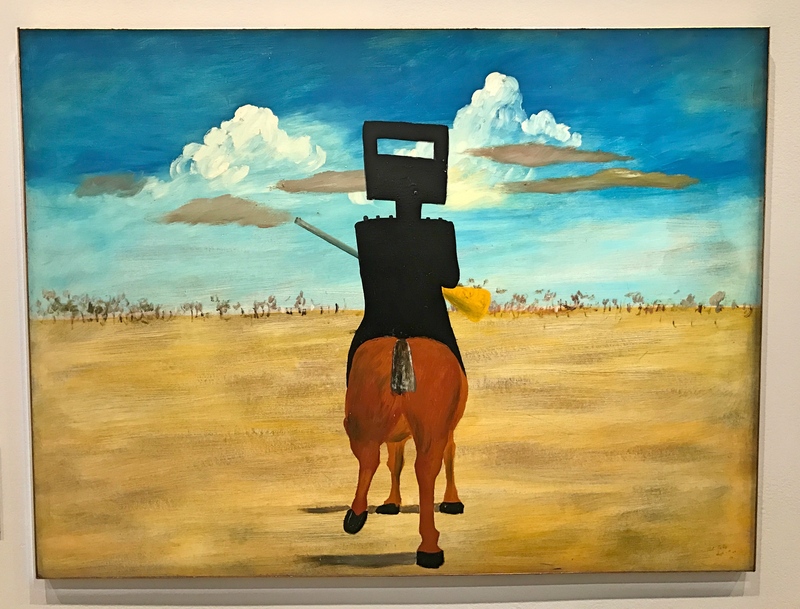 One room was entirely dedicated to 27 pieces Sidney Nolan painted in the mid-20th century about Ned Kelly. Who is Ned Kelly you ask? Well then, you’re obviously not Australian. He was, I learned, Australia’s most famous “bushranger”, a legendary symbol of Australia’s lawless frontier. Sort of Jesse James, I guess. Amazing what you can learn from going to an art museum. 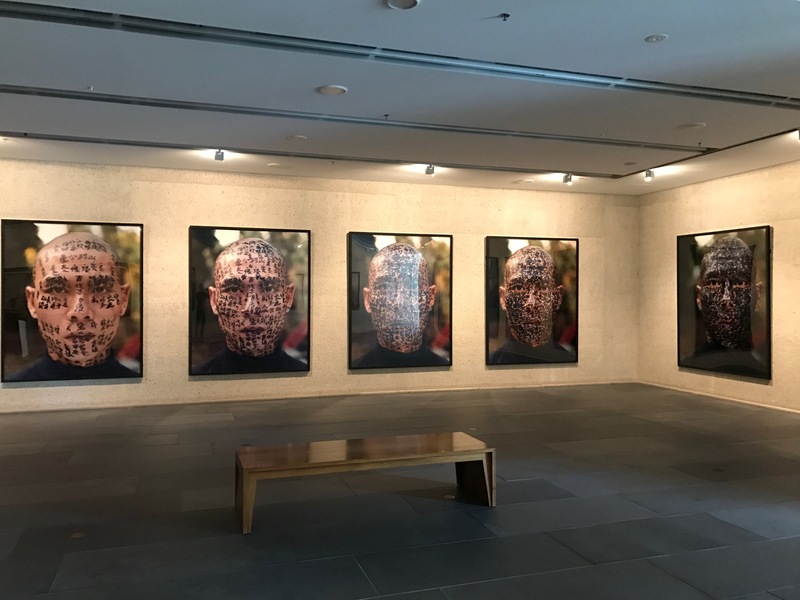 A broader shot of the various pieces in the Zhang Huan exhibit. You had to see them. And finally, this was amazing. 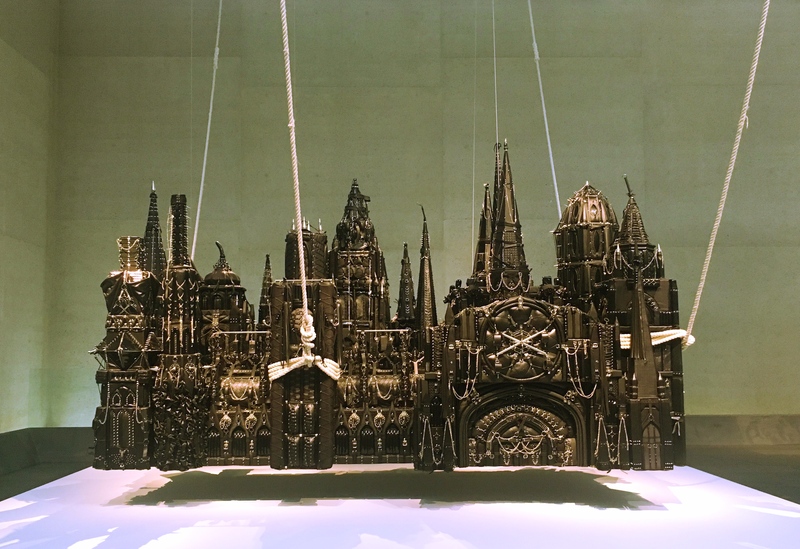 Xu Zhen is another contemporary Chinese artist. When you first walk into the room you can’t figure out exactly what this is. Then you get closer and you see it’s a castle. Made of leather. With all sorts of spikes and studs and handcuffs and ropes and chains. In other words, more provocative than Chinese authorities might allow if they realized what it was all about. You could spend hours contemplating all he was trying to say about contemporary Chinese society in this piece.